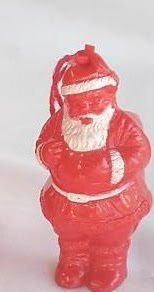 I remember this on our tree, I think it held candy at one point. I don't ever remember seeing candy in it and I don't know where it came from. Probably our aunt next door. Posted by Karen at 9:08 p.m. If you didn't hear, voting is now open for the NL Bloggers Choice Award on the NL BlogRoll. Be sure to get out the vote! !